The search can return posts, custom post types (like WooCommerce products, BBPress forums, topics, replies), Categories, custom taxonomy terms (like product categories), users, buddypress gorups and buddypress activities as results. and even more coming soon. The search supports posts, pages and any kind of custom post type. WooCommerce, Jigoshop, wp-Ecommerce and many other plugins use custom post types – so they are all compatible with Ajax Search Pro. Four built-in layouts: Vertical, Horizontal, Polaroid and Isotopic. 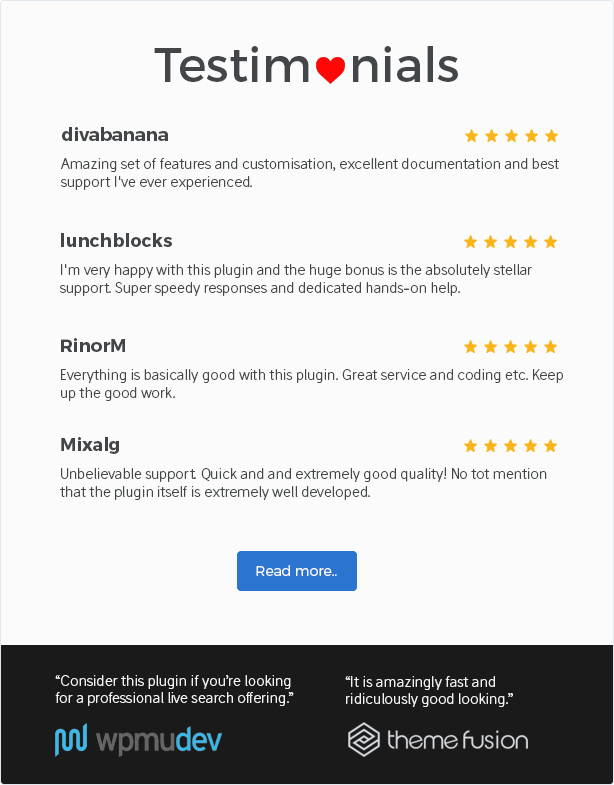 60+ pre-defined theme for each layout, including the ones on the demo page. or just simply display the featured image. You don’t need to worry about touching the code and loosing all the changes with upgrades. The search is packed with hooks for the most convenient access. No frustration = faster coding. - Complete re-work of the core files, into a much better and safer structure. - Individual result groups (terms, posts, buddypress results, etc..) can be ordered now. - The plugin can now override (replace) the default WordPress search results on the results page! - Much better relevance sorting! delete your search instances and the plugin before installing!!! 2012.11.07 - 1.01 - Error reporting issue fixed.